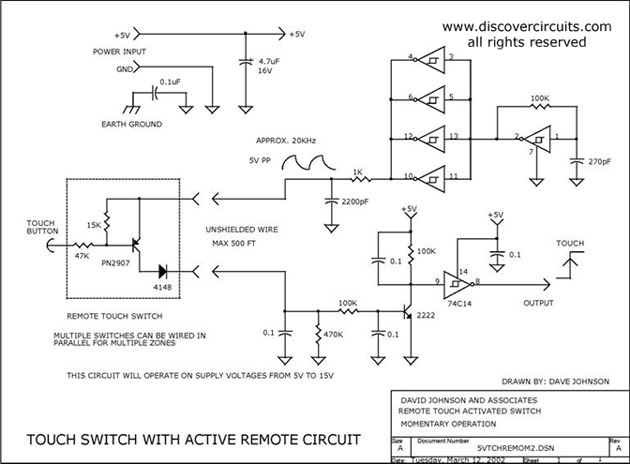 Circuit: single OutPut 120VAC 200 Watt Touch Switch__ Circuits designed by David A. Johnson, P.E. This simple circuit uses a single IC to form a nice touch switch circuit. A single transistor forms the remote active switch sensor. Multiple switches can be wired in parallel. The switch circuit can be located about 500 feet from the control circuit.